Until the currency reforms of AH 77-79 (697-699 AD), the areas recently conquered by Muhammad and the early Rashidun and Ummayad caliphs were struck in a style which closely resembled the pre-existing currencies in the region. In the provinces conquered from the Sassanian Empire - Mesopotamia and eastwards - this style has later come to be known as 'Arab-Sassanian' coinage. 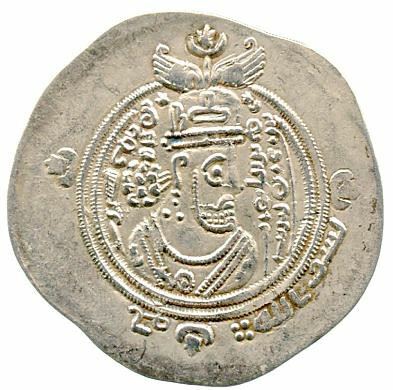 The Arab-Sassanian issues very closely resemble the existing Sassanian silver drachms, but they are feature an additional 'struck in the name of Allah' legend, and are usually imitations of the predominant issue of the period; the drachms of Khusru II.